Miami’s luxury market—particularly its high-end condo sector—is seeing an increase in sales and generally strong numbers overall. One reason for the good news: Buyers from all over the world are discovering it, joining Latin American buyers in snapping up homes in the South Florida city. The number of luxury home sales—defined as those priced at $1 million and up—in Miami rose 21.5% in the 12 months to June, rising from 181 to 220 year on year, according to a recent report from the Miami Association of Realtors. The sales were buoyed in particular by high-end condo sales, which rose 28% year over year. Cash buys in the city made up 38% of all sales in June, a slight rise from 37% last year, and almost double the national average of 22%. 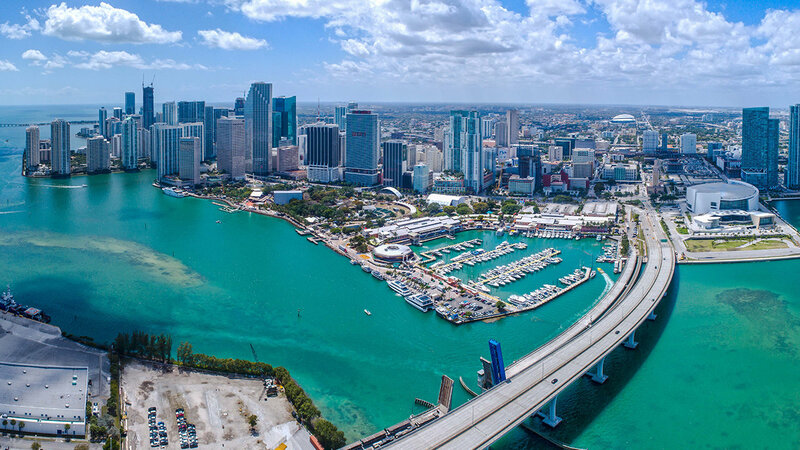 Miami’s high percentage of cash sales reflects South Florida’s ability to attract international home buyers, who choose to bypass what can be a tricky mortgage application process, the report said. But the demographic of those buyers is shifting, some experts say. Long known for its enormous popularity with South American buyers, the makeup of the city’s property owners is adapting. "Before, Miami was the gateway to Latin America," said Oscar Rodriguez, principal of ROVR Development. But it has been evolving "into a very cosmopolitan city, sought after by the whole world," he said. In particular, the city is witnessing more of an influx from European buyers, according to Mr. Rodriguez. He estimates that his international client demographic was previously an 80/20 split between South American and European buyers. But in the last year and a half, the South American buyer’s dominance has slipped slightly. "Now it's more like 65/35," he said. The European buyers Mr. Rodriguez sees are "a healthy mix from everywhere," he said, with particular interest coming from investors from Western Europe. "I have people from Switzerland, France and England," Mr. Rodriguez said. With so many buyers looking for the year-round climate that the city offers "Miami is turning into the Mediterranean of the United States," he added. Turkish buyers have been showing more interest in Miami, too, according to Mr. Rodriguez. "There’s some turmoil going on in their political arena, so a lot of buyers are looking to diversify themselves," he said. "The relative unknown factor [of their own economy], has helped spark more interest." Miami’s transformation into a truly international hub has happened in the last 10 years or so, according to Peggy Olin Fucci, CEO and Founder of OneWorld Properties. Prior to that, "it was a completely different vibe," she said. High-end buyers accustomed to traveling couldn't find the high-end amenities that they were used to, according to her. "If you have a buyer willing to spend $30 million or $40 million, you need places to shop and places to go, now they can get that," Ms. Fucci added. "The cultural calendar has really expanded." Art Basel, hosted each December in Miami Beach, is becoming bigger every year, Ms. Fucci said. The Bass Museum of Art, reopened in October after a $12 million renovation and the Institute of Contemporary Art, Miami opened in December; the Phillip and Patricia Frost Museum of Science had its grand opening in 2017; and the Faena Forum, an events venue with a marble amphitheater, opened in 2016. Despite an altering demographic, the South American buyers aren’t giving up their throne as Miami’s most prevalent international buyers so easily. "South America is still the predominant buying group," said Ron Shuffield, president of EWM Realty International, a Berkshire Hathaway Affiliate. "It’s no different to what we’ve experienced for decades." Between August 2016 and July 2017, Argentinian buyers led the way, accounting for 15% of South Florida foreign purchases, followed by Venezuela (11%) and Colombia (9%), according to a report released earlier this year by the Miami Association of Realtors. On the whole, international buyers aren’t a prevalent as they once were, Mr. Shuffield said. "Three years ago, about 42% of sales over $1 million were international buyers," he said. "Now, it’s about 33%. It’s still a very significant number, but certainly, just anecdotally, we’re not seeing as many international buyers as we were three years ago." One of the reasons is likely the eroding value of some foreign currencies against the dollar, making U.S. purchases more expensive for foreign buyers. Another "is the whole immigration question" and the issuing of visas from the U.S. government, Mr. Shuffield said. "It has not dampened the eagerness of international buyers wanting to purchase in South Florida," he said. But for now, they are biding their time. Another big buyer demographic is the domestic, second-home buyer, he said, who after years of being overshadowed by international buyers, are now more prevalent in the market. Buyers from the northeast in particular, according to Mr. Shuffield, are becoming a larger contingent, turning to Miami to save in income taxes, of which Florida has none. And "as trite as it sounds, our weather is still a draw," Mr. Shuffield said.